A BOSU Balance Trainer, or BOSU ball as it is often called, is a fitness training device, invented in 1999 by David Weck, consisting of an inflated rubber hemisphere attached to a rigid platform. It is also referred to as the “blue half-ball”, because it looks like a stability ball cut in half. The name initially came from an acronym standing for “BOth Sides Up” – a reference to the two ways a BOSU ball can be positioned. Though now, the acronym used by the creators is “BOth Sides Utilised”  The device is often used for balance training. 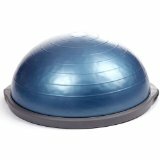 When the dome side faces up, the BOSU ball provides an unstable surface while the device remains stable. This combination of stable/unstable allows a wide range of users, from the young,  elderly, or injured to the elite level athlete. With the dome side up, the device can be used for athletic drills and aerobic activities. As the name suggests, the device can also be flipped over so that the platform faces up. In this position, the device is highly unstable and can be used for a wide array of exercises as well.